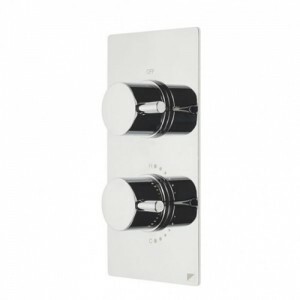 The Roper Rhodes Event thermostatic shower valve has to be the best value shower valve around at present it is a recessed shower valve that is dual control, so it has a separate flow and temperature control. It has been made to compliment Roper Rhodes current range but would also sit very neatly next to lots of other brands of single lever bathroom taps and showers. It has a diverter that can operate two separate items from the one valve, for example you could use it to control a fixed shower head and a shower handset on a riser rail (shower kit), all this and it come with a 10 year guarantee. It is currently on offer at Tapstore.com for just £107.00 you can find out more by clicking here.